The Dow is higher than it's ever been before. 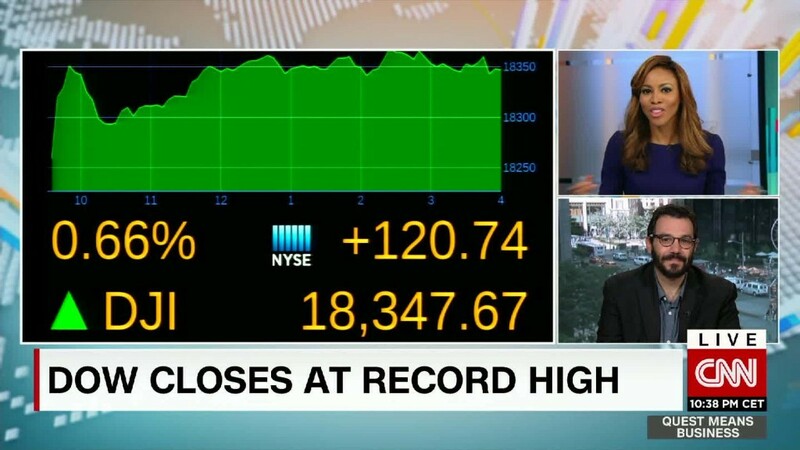 The Dow jumped 121 points to 18,348 on Tuesday, surpassing the previous record set in May 2015 and joining the S&P 500 in uncharted territory. And for the first time this year, even the Nasdaq closed in positive territory for 2016. All of this represents a breakthrough for U.S. markets. Up until recently, they had appeared to have run out of steam and some even thought the seven-year bull market was about to end. The catalyst for the recent big market gains has been the surprisingly strong June jobs report, which dramatically eased fears of a slowdown in the U.S. economy that emerged after hiring slowed down dramatically in May. The Dow is now up more than 400 points since since Friday morning. "There was relief it wasn't another miserable report suggesting a slide towards recession. The euphoric sentiment carried us across the goal line," said Bruce McCain, chief investment strategist at KeyCorp's Key Private Bank. 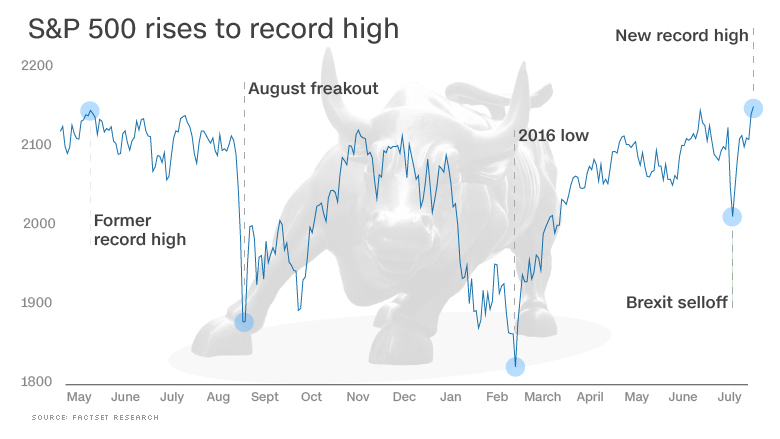 The market milestones come at a surprising time: Just two weeks ago, global markets were in freakout mode after the shocking Brexit vote. The U.K. referendum sent the Dow plummeting nearly 900 points over two days. So is now the time to jump into stocks? Many market veterans are advising caution. One source of concern is that the all the hiring in the U.S. could lead to higher wages, which will dent corporate profits. Earlier on Tuesday JPMorgan Chase (JPM) gave a raise to 18,000 of its lowest paid employees. It came a day after Starbucks (SBUX) also gave raises to its baristas. "We think we're in the latter stages of the economic cycle, which means things will be slower and you'll start to see wage increases that eat into profit margins," said McCain. Another reason for caution is that the markets are not cheap -- and some would even argue they are expensive compared with recent history. Valuation concerns may continue unless companies start signaling that earnings will start growing again. Profits are down three straight quarters, but investors hope the earnings recession will finally end later this year. Alcoa (AA) started earnings season off on the right foot on Monday evening, posting profits that fell less than feared. Shares of the aluminum maker rallied 5% on Tuesday. It's also worth noting that even though stocks are at record highs, the markets aren't exactly going gangbusters. The Dow is only up 5% this year, after rising just 2% last year. And this week's milestones have not been backed up by the enthusiastic trading volumes that would signal strong conviction. "Volume is not impressive," Michael Block, chief strategist at Rhino Trading Partners, wrote in a note, adding that Monday was the weakest trading activity since before the Brexit vote. But stocks continue to rise as investors face limited alternatives for their money. Bonds look even more expensive than stocks, especially because the Brexit turmoil sent cash fleeing to the safety of government debt.